Digital health is not only about single inventions, shiny gadgets, latest trends and buzz words like Artificial Intelligence, Internet of Things, Big Data, health apps, virtual reality or 3D printers. What matters is the holistic transformation of healthcare where the patient is placed in the center of all decisions, strategies and solutions. This is our shared responsibility and everybody has to be on board: patients, doctors, nurses, healthcare managers, politicians, pharmacists, medicine students, start-ups, IT companies, payers, non-profit organizations. We ALL create a complex healthcare ecosystem where every single part affects how the system works. Is digitalization a “Holy Grail” for quality and cost effectiveness in healthcare? We would say it’s good to dream big. Clear visions help us to stay motivated and focused. But instead of waiting for miracles, now is the right time to act. On the other hand, the more challenges and changes, the more questions, doubts and fears. That’s why we need a right knowledge – a right key to understand the potential opportunities and minimize threats of the technological revolution. ICT&health International presents the wide spectrum of the digital transformation in healthcare in an objective, sharp and understandable way, including different perspectives and opinions. The mission of the ICT&health is to become a reliable and up-to-date source of news and knowledge for all stakeholders, healthcare industry representatives and patients, regardless of the digital health literacy, language or country. Read daily news, interviews with international experts, practical advices, statistics. Follow discussions, health apps recommendations, infographics. Explore newest innovations, unique case studies and reports. Become a leader of the digital transformation. All content, both online and offline, are compiled in collaboration with international contributors that our editorial board consists of – Medical specialists, Doctors, physicians, scientists, patients, government officials and innovation leaders. 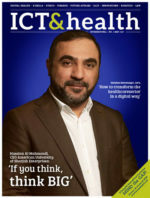 ICT&health is also the only leading magazine in its field that combines views and experience from both medical experts and patients. 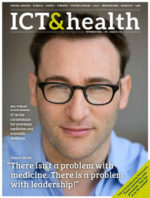 Download here the first two editions of ICT&health magazine.